Use this Automatic White LED Lamp in the Child’s study room to avoid the panic situation of a sudden power failure. It gives sufficient light to move away from the room. Make it and impress the child.If it is enclosed in Doll with White LED as the head light, the child will be happy. 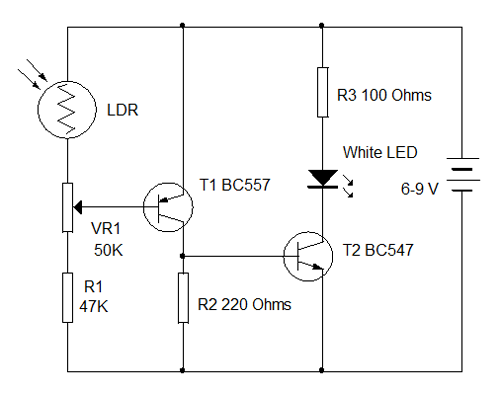 The circuit uses LDR as light sensor. When there is light in the room, either daylight or light from bulb, LDR conducts and keeps T1 off since its base remains positive. In this condition T2 will be also off due the lack of base bias. The LED connected to the collector of T2 remains off. When there is power failure, the room becomes dark and the resistance of LDR increases and T1 turns on .T2 then turns on and the White LED lights. VR1 is used to set the sensitivity of LDR at the particular light level in the room. when i got the alert post, I thought you have used the AC line sensing, but you have taken the light sensor. you are correct. Darkness is the main criteria. can there be .and. circuit with USE AC mode? 🙂 I have introduced your site to my engineering entry batch students. They are enjoying the basics. Thank you very much for your service to electronics’ enthusiasts. May the almighty give you more strength to accomplish this task in a greater scope.